An all-terrain vehicle (ATV), also known as a quad, three-wheeler, four-track, four-wheeler, or quadricycle, as defined by the American National Standards Institute (ANSI) is a vehicle that travels on low-pressure tires, with a seat that is straddled by the operator, along with handlebars for steering control. As the name implies, it is designed to handle a wider variety of terrain than most other vehicles. Although it is a street-legal vehicle in some countries, it is not street-legal within most states and provinces of Australia, the United States, or Canada. By the current ANSI definition, ATVs are intended for use by a single operator, although some companies have developed ATVs intended for use by the operator and one passenger. In some countries, the passenger is not required to wear a helmet. These ATVs are referred to as tandem ATVs. The rider sits on and operates these vehicles like a motorcycle, but the extra wheels give more stability at slower speeds. Also dirt bikes are considered to be ATVs as that they were designed for off road use only. Although most are equipped with three or four wheels, six-wheel models exist for specialized applications. Engine sizes of ATVs currently for sale in the United States, (as of 2008 products), range from 49 to 1,000 cc (0.049 to 1.0 L; 3.0 to 61 cu in). Royal Enfield built and sold the first powered quadracycle in 1893. It had many bicycle components, including handle bars. The Royal Enfield resembles a modern ATV-style quadricycle but was designed as a form of horseless carriage for road use. The term "ATV" was originally coined to refer to non-straddle ridden, typically six-wheeled, amphibious ATVs, such as the Jiger produced by the Jiger Corporation, the Amphicat produced by Mobility Unlimited Inc, and the Terra Tiger produced by the Allis-Chalmers Manufacturing Company in the mid 1960s and early 1970s. With the introduction of straddle ridden ATVs, the term AATV was introduced to define the original amphibious ATV category. The first three-wheeled ATV was the Sperry-Rand Tricart. It was designed in 1967 as a graduate project of John Plessinger at the Cranbrook Academy of Arts near Detroit. The Tricart was straddle-ridden with a sit-in rather than sit-on style (similar to the contemporaneous Big Wheel toy). In 1968 Plessinger sold the Tricart patents and design rights to Sperry-Rand New Holland who manufactured them commercially. Numerous small American manufacturers of 3-wheelers followed. These small manufacturers were unable to compete when larger motorcycle companies like Honda entered the market in 1969. Honda introduced their first sit-on straddle-ridden three-wheeled ATVs in 1969, which were famously portrayed in the James Bond movie, Diamonds Are Forever and other TV shows such as Magnum, P.I. and Hart to Hart. These were originally dubbed the US90; Honda then trademarked the term "All Terrain Cycle" (ATC), the name which has come to be used for all vehicles of the type. Clearly influenced by earlier ATVs, it featured large balloon tires instead of a mechanical suspension. By the early 1980s, suspension and lower-profile tires were introduced. The 1982 Honda ATC200E Big Red was a landmark model. It featured both suspension and racks, making it the first utility three-wheeled ATV. The ability to go anywhere on terrain that most other vehicles could not cross soon made them popular with US and Canadian hunters, and those just looking for a good trail ride. Soon other manufacturers introduced their own models. Sales of utility machines skyrocketed. Sport models were also developed by Honda, which had a virtual monopoly in the market due to effective patents on design and engine placement. The 1981 ATC250R was the first high-performance three-wheeler, featuring full suspension, a 248 cc (0.248 L; 15.1 cu in) air cooled two-stroke engine, a five-speed transmission with manual clutch, and a front disc brake. For the sporting trail rider, the 1983 ATC200X was another landmark machine. It used an easy-to-handle 192 cc (0.192 L; 11.7 cu in) four-stroke that was ideal for new participants in the sport. The ATC200X was the first high-performance four-stroke ATV that featured full suspension, front and rear disc brakes with single piston calipers, an 18-horsepower (13.4 kW) engine, sporty looks and is widely considered one of the best ATVs ever produced. Today, ATC200Xs can be found on the market in all conditions and prices, and is still highly regarded and followed by the aftermarket community. In 1985, Honda also introduced the new ATC350X. The ATC350X was another high-performance three-wheeler, similar to the ATC200X, but as an entirely new machine. The 350X featured a 26-horsepower (19.4 kW) air and oil cooled 350 cc (0.350 L; 21.4 cu in) four-stroke engine with a 4-valve head; impressive technology for the time. The engine was so good, it found its way into many hybrid race four-wheelers in later years. The engine was a torque monster, and Honda wasn't afraid to call the 350X "the King of the Hill" in its marketing of the machine. The suspension was a step in between the all new ATC250R (which featured a 246 cc (0.246 L; 15.0 cu in) liquid-cooled 2-stroke engine and nearly 10 inches of travel in its suspension, front and back) and the ATC200X, with 8.5 inches (220 mm) of travel in the front forks. The 350X featured disc brakes with dual piston brake calipers for superb stopping power. However, the 350X suffered in handling with an underbuilt chassis which made the machine unpopular with racers, except for those who chose to be different by racing a four-stroke machine as two-strokes were the engine of choice at the time. The aftermarket came out with a custom gusset kit that significantly strengthens the frame at its weakest points for riders that wish to build a race machine. In 1986, the ATC200X got a complete redesign. The machine shared nothing in common with its predecessor than the name. It got an all new 199 cc (0.199 L; 12.1 cu in) four-stroke engine, white plastics which were notably sportier, longer suspension travel, and a completely resigned "box" frame, which was made of square tubing instead of round tubing for a significant strength increase. The ATC350X also got various updates, including white plastics and most notably a revised oil pickup point in the engine, to help reduce engine oil starvation when riding long wheelies. Other models, such as the ATC250SX were sold. The ATC250SX was the first sport utility ATV. It featured a 250 cc (0.250 L; 15.3 cu in) air-cooled four-stroke engine that like the later revised Big Reds, were shaft propeller instead of chain. It featured larger balloon tires and a sportier look than the similar Big Reds, but could be ordered with cargo racks if the buyer chose to. For 1985 and later 1986, Honda introduced an all new ATC250R. Different from previous generations, the new machines was most notably larger, sportier and now featured a liquid-cooled 246 cc (0.246 L; 15.0 cu in) two-stroke. At a light weight of 292 lb (132 kg), the machine was incredibly quick for the day, with a high 38 horsepower (28.3 kW) rating. Today, the 1985–86 ATC250R is arguably considered the greatest three-wheeler of all time, and aftermarket support still follows the machine. The bike is widely raced across the United States and can be found on the used market for a bargain. Over the next few years, all manufacturers except Suzuki, developed high-performance two-stroke machines, but did not sell as many due to the reputation already secured by Honda. These models were the Yamaha Tri-Z YTZ250 with a 246 cc (0.246 L; 15.0 cu in) two-stroke engine and a manual five- or six-speed gearbox and the Kawasaki Tecate KXT250 with a 249 cc (0.249 L; 15.2 cu in) two-stroke with a five or 6 speed gearbox. However, the Honda ATC250R still proved to be more popular than both others, with owners and racers citing that it had a more usable power band and handled the best of the three. It continued to outsell both the Tri-Z and Tecate in large numbers, including when the machines were converted from three to four wheels and sold side by side. American manufacturer Tiger ATV also built various three-wheelers, in sizes ranging from 125 to 500 cc (0.125 to 0.500 L; 7.63 to 30.5 cu in) Rotax two-stroke engines. The Tiger 500 is considered to be one of the fastest ATVs of all time, which claims of top speeds being over 100 mph with a nearly 50 horsepower (37.3 kW) engine and 5 speed gearbox. However, due to the rarity of the machine, it remains a legend. The Tiger 200 and 250s are the most common machines. All were custom ordered and built to the buyers specifications for factory ATV racing. The Tiger Super-4 was a four-wheeled 250 cc (0.250 L; 15.3 cu in) 2 stroke machine that later replaced the three-wheelers. The Tiger manufacturing plant was closed and demolished in 1992. Production of three-wheelers ceased in 1987 due to safety concerns: three-wheelers were more unstable than four-wheelers (although accidents are equally severe in both classes). The duration of the voluntary cease of production (manufacturers were not required to halt production but agreed to it) lasted 10-years and thus since 1997, manufacturers were free to once again manufacture and market three-wheelers. A ban on sales of new or used three-wheelers and a recall of all remaining three-wheelers has been proposed by the American Academy of Pediatrics. However, it was determined in a CPSC study that three-wheelers are no more dangerous than other ATVs. The ban lead to widespread thought that the machines are unregistrable, uninsurable, dangerous, and even illegal, but is false. These safety issues with three-wheel ATVs caused all ATV manufacturers to upgrade to four-wheel models in the late 1980s, and three-wheel models ended production in 1988, due to consent decrees between the major manufacturers and the Consumer Product Safety Commission—the result of legal battles over safety issues among consumer groups, the manufacturers and CPSC. The lighter weight of the three-wheel models made them popular with expert riders. Cornering is more challenging than with a four-wheeled machine because leaning into the turn is even more important, to counterbalance the weight and keep the machine stable. Operators may roll over if caution isn't used at high speeds. The front end of three-wheelers obviously has a single wheel, making it lighter, and flipping backwards is a potential hazard, especially when climbing hills. Rollovers may also occur when traveling down a very steep incline. However, in most terrain with the proper riding technique and safety gear, accidents are not an issue. Three-wheelers take more time to learn to ride properly than other machines and require a different style that others as well; such as leaning to the inside of the turn and steering with the throttle. The key is to break traction with the rear tires and "power slide". The consent decrees expired in 1997, allowing manufacturers to, once again, make and market three-wheel models, though there are none marketed today. Recently, the CPSC has succeeded in finally banning importation of three-wheeled ATVs with attachments to bill HR4040. Many believe this is in response to Chinese manufacturers trying to import three-wheeled ATVs. The Japanese manufacturers were also behind this legislation, as they have been held responsible for years to provide ATV Safety training and to apply special labels and safety equipment to their ATVs while Chinese manufacturers did not. Three-wheelers can still be continued to be built and sold by American manufacturers if any chose to build them. Suzuki was a leader in the development of four-wheeled ATVs. It sold the first model, the 1982 QuadRunner LT125, which was a recreational machine for beginners. Suzuki sold the first four-wheeled mini ATV, the LT50, from 1984 to 1987. After the LT50, Suzuki sold the first ATV with a CVT transmission, the LT80, from 1987 to 2006. In 1985 Suzuki introduced to the industry the first high-performance four-wheel ATV, the Suzuki LT250R QuadRacer. This machine was in production for the 1985–1992 model years. During its production run it underwent three major engineering makeovers. However, the core features were retained. These were: a sophisticated long-travel suspension, a liquid-cooled two-stroke motor and a fully manual five-speed transmission for 1985–1986 models and a six-speed transmission for the 87–92 models. It was a machine exclusively designed for racing by highly skilled riders. Honda responded a year later with the FourTrax TRX250R—a machine that has not been replicated until recently. It currently remains a trophy winner and competitor to big-bore ATVs. Kawasaki responded with its Tecate-4 250. The TRX250R was very similar to the ATC250R it eventually replaced, and is often considered one of the greatest sport ATVs ever built. In 1987, Yamaha Motor Company introduced a different type of high-performance machine, the Banshee 350, which featured a twin-cylinder liquid-cooled two-stroke motor from the RD350LC street motorcycle. Heavier and more difficult to ride in the dirt than the 250s, the Banshee became a popular machine with sand dune riders thanks to its unique power delivery. The Banshee remains popular, but 2006 is the last year it was available in the U.S. (due to EPA emissions regulations); it remained available in Canada until 2008 and in Australia until 2012.The Warrior 350 was introduced in 1987 and went on for years as a light and fast ATV. Shortly after the introduction of the Banshee in 1987, Suzuki released the LT500R QuadRacer. This unique quad was powered by a 500 cc liquid-cooled two-stroke engine with a five-speed transmission. This ATV earned the nickname "Quadzilla" with its remarkable amount of speed and size. While there are claims of 100+ mph (160 km/h) stock Quadzillas, it was officially recorded by 3&4 Wheel Action magazine as reaching a top speed of over 79 mph (127 km/h) in a high-speed shootout in its 1988 June issue, making it the fastest production four-wheeled ATV ever produced. Suzuki discontinued the production of the LT500R in 1990 after just four years. At the same time, development of utility ATVs was rapidly escalating. The 1986 Honda FourTrax TRX350 4x4 ushered in the era of four-wheel drive ATVs. Other manufacturers quickly followed suit, and 4x4s have remained the most popular type of ATV ever since. These machines are popular with hunters, farmers, ranchers and workers at construction sites. Models continue, today, to be divided into the sport and utility markets. Sport models are generally small, light, two-wheel drive vehicles that accelerate quickly, have a manual transmission and run at speeds up to approximately 80 mph (130 km/h). Utility models are generally bigger four-wheel drive vehicles with a maximum speed of up to approximately 70 mph (110 km/h). They have the ability to haul small loads on attached racks or small dump beds. They may also tow small trailers. Due to the different weights, each has advantages on different types of terrain. A popular model is Yamaha's Raptor 700, which features a nearly 700 cc four-stroke engine. Six-wheel models often have a small dump bed, with an extra set of wheels at the back to increase the payload capacity. They can be either four-wheel drive (back wheels driving only), or six-wheel drive. In 2011 LandFighter was founded, "the first Dutch/European ATV brand". The largest part of production takes site in Taiwan, to European standards; the ATVs are finally assembled in the Netherlands. Safety has been a major issue with ATVs due to the high number of deaths and injuries associated with them and the negligible protection offered by the machine. The modern breed of ATVs was introduced in the early 1970s and almost immediately realized alarming injury rates for children and adolescents. Based on analysis of the National Trauma Data Bank, ATVs are more dangerous than dirt bikes, possibly due to crush injuries and failure to wear safety gear such as helmets. They are as dangerous as motorcycles, based on mortality and injury scores. More children and women are injured on ATVs, who also present a lower rate of helmet usage. Many common injuries can be prevented with the use of proper protective equipment. Most ATV manufacturers recommend at least a suitable DOT-approved helmet, protective eyewear, gloves and suitable riding boots for all riding conditions. Sport or aggressive riders, or riders on challenging terrain (such as those rock crawling or hillclimbing), may opt for a motocross-style chest protector and knee/shin guards for further protection. Proper tires (suited to a particular terrain) can also play a vital role in preventing injuries. Fatal accidents typically occur when the vehicle rolls over. In the United States, statistics released by the Consumer Product Safety Commission (CPSC) show that in 2005, there were an estimated 136,700 injuries associated with ATVs treated in US hospital emergency rooms. In 2004, the latest year for which estimates are available, 767 people died in ATV-associated incidents. According to statistics released by CPSC, the risk of injury in 2005 was 171.5 injuries per 10,000 four-wheel ATVs in use. The risk of death in 2004 was 1.1 deaths per 10,000 four-wheelers in use. Focus has shifted to machine size balanced with the usage of ATVs categorized by age ranges and engine displacements—in line with the consent decrees. ATVs are mandated to bear a label from the manufacturer stating that the use of machines greater than 90 cc by riders under the age of 12 is prohibited. This is a 'manufacturer/CPSC recommendation' and not necessarily state law. The American Academy of Pediatrics and the CPSC recommended that no children under the age of 16 should ride ATVs. A Canadian study stated that "associated injury patterns, severity, and costs to the healthcare system" of pediatric injuries associated to ATVs resemble those caused by motor vehicles, and that public policies should reflect this fact. Helmets are underutilized and result in Glasgow Coma Scale scores in children presenting from ATV accidents being similar to those in motorcycle accidents. Quad bike two-wheel trick-riding on sand dune. According to The New York Times on September 2, 2007, the Consumer Product Safety Commission met in March 2005 to discuss the dangers of ATVs. Data from 2004 showed 44,000 children under 16 injured while riding ATVs, 150 of them fatally. Says the Times, "National associations of pediatricians, consumer advocates and emergency room doctors were urging the commission to ban sales of adult-size ATVs for use by children under 16 because the machines were too big and fast for young drivers to control. But when it came time to consider such a step, a staff member whose name did not appear on the meeting agenda unexpectedly weighed in." That staff member was John Gibson Mullan, "the agency's director of compliance and a former lawyer for the A.T.V. industry" – the Times bases the claim on a recording of the meeting. Mullan reportedly said that the existing system of warnings and voluntary compliance was working. The agency's hazard statistician, Robin Ingle, was not allowed to present a rebuttal. She told the Times in an interview, "He had hijacked the presentation. He was distorting the numbers in order to benefit industry and defeat the petition. It was almost like he still worked for them, not us." CPSC reports of ATV deaths and injuries show an increase in the raw numbers of deaths and injuries that is statistically significant. The rate of deaths and injuries, which takes into account that the number of ATVs in use has risen over the last ten years, has been shown to have experienced no statistically significant change. The United States government maintains a website about the safety of ATVs where safety tips are provided, such as not driving ATVs with a passenger (passengers make it difficult or impossible for the driver to shift their weight, as required to drive an ATV) or not driving ATVs on paved roads (ATVs usually have a solid rear axle with no differential). In 1988, the All-terrain Vehicle Safety Institute (ASI) was formed to provide training and education for ATV riders. The cost of attending the training is minimal[clarification needed] and is free for purchasers of new machines that fall within the correct age and size guidelines. Successful completion of a safety training class is, in many states, a minimum requirement for minor-age children to be granted permission to ride on state land. Some states have had to implement their own safety training programs, as the ASI program cannot include those riders with ATVs outside of the age and size guidelines, which may still fall within the states' laws. In industry, agriculture workers are disproportionately at risk for ATV accidents. Most fatalities occur in white men over the age of 55. A "Quad" is recognised by UK law as a vehicle with four wheels and a mass of less than 550 kg (1,210 lb). To drive a quad cycle on a public road, in the UK, requires a B1 licence as well as tax, insurance and registration. In the United Kingdom, the safety issues of cars classed as quad cycles are illustrated by the case of the G-Wiz (REVAi). The neighborhood electric vehicle was given a Euro NCAP specification test, and the results showed that the vehicle's occupants would suffer "serious or life-threatening" injuries in a 64 km/h (40 mph) crash. The UK Department for Transport concluded that there were serious safety concerns when the REVA was crashed at 35 mph (56 km/h). After consultation with stakeholders including farmers and quad cycle manufacturers, Australia's Heads of Workplace Safety Authorities (HWSA) in 2011 released a strategy intended to reduce the number of deaths and serious injuries associated with quad-bike use. The development of the report was closely followed by The Weekly Times newspaper and ABC television which reviewed the issue through its 7.30 program. Apart from encouraging of standard safety measures such as helmet-wearing, the strategy also recommend development of a national training curriculum, point of sale material for purchasers and, controversially, a recommendation that owners consider fitting of an after-market anti-crush device which may offer added protection in the event of a roll-over. When the report was released the only model of anti-crush protection on the market was the Australian-made "Quad bar" which was vigorously opposed by the industry through media activity and a poster campaign at regional events for farmers which are often used to showcase new products. The industry argued that the device had not been properly tested and that past studies of tractor-style ROPS such as a full-frame 'cage' around the operator were not only ineffective, but could add to the risk to injury or death. In February 2012, the Melbourne-based Institute for Safety, Compensation and Recovery Research (ISCRR) published a paper which criticised the research claims of the manufacturers in relation to crush protection devices. The paper reviewed research in a number of countries since 1993 in relation to rollover protection and found that the industry's opposition to rollover protection could not be supported because of limitations in past research. It recommended further research on the topic and the development of research tools based on the use of ATV/quadbikes in Australian conditions. ATVs accounted for 58% of the SI (spark ignited) recreational vehicles in the US in the year 2000. That year, recreational SI vehicles produced 0.16% of NOx, 8% of HC, 5% of CO and 0.8% of PM emissions for all vehicles, both highway and nonroad. As a point of comparison, the nonroad SI < 19 kW (~25 hp) category (small spark ignition engines such as lawnmowers) comprised 20% of HC and 23% of CO total emissions. While recreational SI vehicles produce an aggregate of <4% of all HC emissions in the US, based on the relatively small population of ATVs (<1.2M) and small annual usage (<350 hrs), EPA emission regulations now include such engines, starting with the model year 2006. Engines meeting these standards now produce only 3% of the HC emissions that previously unregulated engines did. ATVs in New Brunswick, Canada. Note that one of them is plated, an obligation in New Brunswick to legally cross and roll on roads for a maximum of a few hundred meters. While the deep treads on some ATV tires are effective for navigating rocky, muddy and root covered terrain, these treads are also capable of digging channels that may drain bogs, increase sedimentation in streams at crossings and damage groomed snowmobile trails. Proper trail construction techniques can mitigate these effects. In some countries where fencing is not common, such as the US, Canada and Australia, some of ATV riders knowingly cross privately owned property in rural areas and travel over public/private properties, where their use is limited only to trails. Subsequently, environmentalists criticize ATV riding as a sport for excessive use in areas biologists consider to be sensitive, especially wetlands and sand dunes and in much of inland Australia. Because both scientific studies and U.S. National Forest Service personnel have identified unregulated Off-Road Vehicles (ORVs) as the source of major detrimental impacts on national forests, the U.S. Forest Service is currently engaged in the Travel Management Process, wherein individual forests are restricting all off-road motorized travel to approved trails and roads. This is in contrast to its previously allowed, unregulated cross-country travel across all national forest lands, except for specifically designated wilderness areas. Although ORVs had been identified 30 years ago as a threat to wild ecosystems by the Forest Service, only after pressure by an unlikely alliance of environmentalists, private landowners, hunters, ranchers, fishermen, quiet recreationists and forest rangers themselves (who identified ORVs as a "significant law enforcement problem" in national forests). has action been taken. The Travel Management Rule was initiated in 2004; completion is expected in 2010. Rider cleaning an ATV at a U.S. Forest Service pressure washer station to prevent the spread of invasive plants. ATVs using tracks instead of wheels are used at France's Cap Prudhomme in Antarctica. ATVs are also used in agriculture to bridge the advantages of trucks and tractors. Sport models are built with performance, rather than utility, in mind. To be successful at fast trail riding, an ATV must have light weight, high power, good suspension and a low center of gravity. These machines can be modified for such racing disciplines as motocross, woods racing (also known as cross country), desert racing (also known as Hare Scrambles), hill climbing, ice racing, speedway, Tourist Trophy (TT), flat track, drag racing and others. ATV National Motocross Championship was formed around 1985. 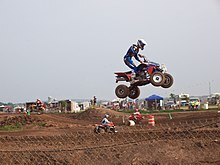 ATVMX events are hosted at premiere motocross racetracks throughout the United States. ATVMX consists of several groups, including the Pro (AMA Pro) and Amateur (ATVA) series. Friday involves amateur practicing and racing on Saturday and Sunday. Saturday also involves racing for the Pro Am Women and Pro Am Unlimited classes. Sunday involves racing for the Pro and Pro Am production ATVs, but are scored separately. On average weekend over 500 racers will compete. The FIM organizes the Quadcross of Nations at the end of the year. The competition involves teams of three riders representing their nations. There are three motos with two riders of each nation competing per moto. The location of the event changes from year to year. Championship Mud Racing/CMR saw its infancy in 2006 as leaders of the ATV industry recognized a need for uniformity of classes and rules of various local mud bog events. Providing standardized rules created the need for a governing body that both racers and event promoters could turn to and CMR was born. Once unified, a true points series was established and lead to a national championship for what was once nothing more than a hobby for most. In 2007 the finalized board of directors was established and the first races were held in 2008. Currently, the CMR schedule includes eight competition dates spanning from March to November. Points are awarded throughout the season in several different competition classes of ATV and SxS Mud Racing. The 2008 year included Mud Bog and Mudda-Cross competitions, but the 2009 and future seasons will only have Mudda-Cross competitions. Classes range from 0–499 cc to a Super-Modified class which will allow any size ATV in competition. The ultimate goal of The CMR is "to see the growth of ATV Mud Racing as a competitive sport and give competitors a pedestal upon which they can receive the recognition from national media and industry sponsors that they have long deserved." There is an ATV class in the Dakar Rally. Karim Dilou of Tunisia won the FIM Cross Country Rallies World Cup – Quad in 2008, riding for Yamaha. Amateur and professional three-wheeler racing across the United States has also spiked in popularity once again, at levels not seen since the factory teams raced in the 1980s. Part of the appeal is the cheapness of parts, and how easy it is to get into. Races are held at various local and large venues, particularly in Ohio, New York, Pennsylvania, Arizona, Michigan and California. Payouts are sometimes awarded to winners. Each year in June, the worlds biggest three-wheeler gathering is held at Haspin Acres, in Laurel, Indiana, for the Trikefest event. Over the course of 3 days complete with camping, hundreds of people gather for the event which features competitive racing such as MX style racing, drag racing, mud racing, hill climbs and other events. For those who wish not to compete, there are also many trails a person can ride. as many as 100 or more three-wheelers show up each year, some built and restored to be raffled off, others brought to ride. The fastest speed recorded on a quad cycle, or ATV given a flying start, is 315.74 km/h (196.19 mph), by Terry Wilmeth (USA), at the Madras, Airport in Madras, Oregon, USA, on 15 June 2008. ^ "Standards for All Terrain Vehicles and Ban of Three-Wheeled All Terrain Vehicles; Proposed Rule". Consumer Product Safety Commission (Federal Register). 10 August 2006. Archived from the original on 13 January 2008. Retrieved 26 December 2007. ^ Chris Cooper. "ATC90 History". Archived from the original on 16 December 2006. Retrieved 2 January 2007. ^ Centers for Disease Control and Prevention (CDC) (March 2008). "All-terrain vehicle fatalities—West Virginia, 1999–2006". Morbidity and Mortality Weekly Report. 57 (12): 312–5. PMID 18368006. ^ Ganos D, Crady S, Poortenga S, Hoffman G, Mann R (July 1988). "Trauma associated with three- and four-wheeled all-terrain vehicles: is the four-wheeler an unrecognized health hazard?". The American Surgeon. 54 (7): 429–33. PMID 3389591. ^ "All-terrain vehicle injury prevention: two-, three-, and four-wheeled unlicensed motor vehicles". Pediatrics. 105 (6): 1352–4. June 2000. doi:10.1542/peds.105.6.1352. PMID 10835081. ^ Kirkpatrick R, Puffinbarger W, Sullivan JA (2007). "All-terrain vehicle injuries in children". Journal of Pediatric Orthopedics. 27 (7): 725–28. doi:10.1097/BPO.0b013e3181558856. PMID 17878773. ^ Acosta JA, Rodríguez P (August 2003). "Morbidity associated with four-wheel all-terrain vehicles and comparison with that of motorcycles". The Journal of Trauma. 55 (2): 282–84. doi:10.1097/01.TA.0000080525.77566.ED. PMID 12913638. ^ Fonseca AH, Ochsner MG, Bromberg WJ, Gantt D (November 2005). "All-terrain vehicle injuries: are they dangerous? A six-year experience at a level I trauma center after legislative regulations expired". The American Surgeon. 71 (11): 937–40, discussion 940–1. PMID 16372612. ^ "ATV Accidents | Injury Information.com – Information about Injuries, Treatment, and Rehabilitation". www.injuryinformation.com. Retrieved 19 January 2018. ^ a b c d Helmkamp, Jim (24 October 2012). "All-terrain Vehicles and Work". National Institute for Occupational Safety and Health (NIOSH). Retrieved 22 January 2015. ^ "CPSC 2005 Annual Report of Deaths and Injuries" (PDF). Archived from the original (PDF) on 28 January 2007. Retrieved 15 May 2007. ^ Brown RL, Koepplinger ME, Mehlman CT, Gittelman M, Garcia VF (March 2002). "All-terrain vehicle and bicycle crashes in children: epidemiology and comparison of injury severity". Journal of Pediatric Surgery. 37 (3): 375–80. doi:10.1053/jpsu.2002.30826. PMID 11877651. ^ Miller B, Baig M, Hayes J, Elton S (September 2006). "Injury outcomes in children following automobile, motorcycle, and all-terrain vehicle accidents: an institutional review". J. Neurosurg. 105 (3 Suppl): 182–6. doi:10.3171/ped.2006.105.3.182. PMID 16970230. ^ Eric Lipton (2 September 2007). "Safety Agency Faces Scrutiny Amid Changes". The New York Times. Retrieved 26 December 2007. ^ "CPSC 2005 Annual Report of Deaths and Injuries" (PDF). Archived from the original (PDF) on 9 September 2008. Retrieved 26 August 2008. ^ "Your full driving license" (PDF). DVLA. 18 August 2006. Archived from the original on 10 October 2008. Retrieved 16 April 2008. ^ "Quad bikes: the rules". Government of the United Kingdom. Retrieved 25 July 2013. ^ "G-Wiz crash test news – Electric shock". Top Gear. 9 May 2007. Archived from the original on 15 April 2008. Retrieved 28 February 2008. ^ "7.30". ABC. 13 September 2011. Retrieved 18 November 2012. ^ "Google Image Result for". Google.com.au. 16 June 2011. Retrieved 18 November 2012. ^ "Aussies' love for SUVs continues in October". FCAI. 5 November 2012. Retrieved 18 November 2012. ^ "ATV Safety". 23 August 2011. Retrieved 18 November 2012 – via YouTube. ^ "Quad bike safety devices – case study". Institute for Safety, Compensation and Recovery Research (ISCRR). Archived from the original on 25 February 2014. Retrieved 26 June 2014. ^ "Emission Modeling for Recreational Vehicles" (PDF). Archived from the original (PDF) on 30 July 2004. Retrieved 21 September 2006. ^ "EPA Regulatory Announcement on ATV emission standards" (PDF). Retrieved 21 September 2006. ^ a b c "36 CFR Parts 212, 251, 261, and 295; RIN 0596–AC11; Travel Management; Designated Routes and Areas for Motor Vehicle Use" (PDF). Federal Register. U.S. Forest Service. 9 November 2005. ^ "ATV power wash station helping to wash out invasive plants on the Chequamegon-Nicolet NF". U.S. Forest Service. 7 July 2009. Retrieved 8 May 2011. ^ Eacott, John. Stunning Antarctica. Date: 20 November 2009. Retrieved 30 January 2011. ^ Glenday, Craig (2013). Guinness World Records 2014. The Jim Pattison Group. p. 101. ISBN 978-1-908843-15-9. Wikimedia Commons has media related to All-terrain vehicles.